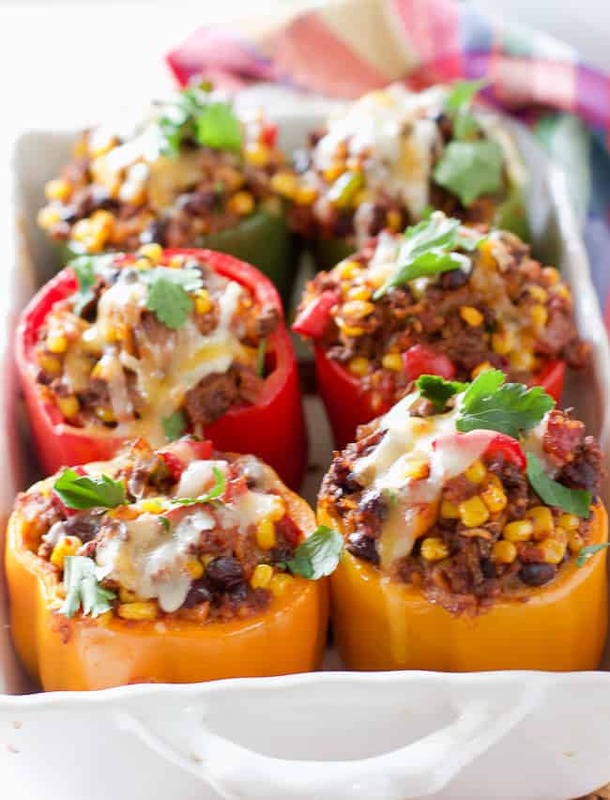 These Southwest Stuffed Peppers are chock full of beef, rice, corn and beans. Ground chicken or turkey can be subbed for the beef. Top with gooey cheese and sour cream! We love this recipe! It’s so beautiful, with fresh colorful ingredients. This dish comes together easily once the rice is made…and I have secret for that! 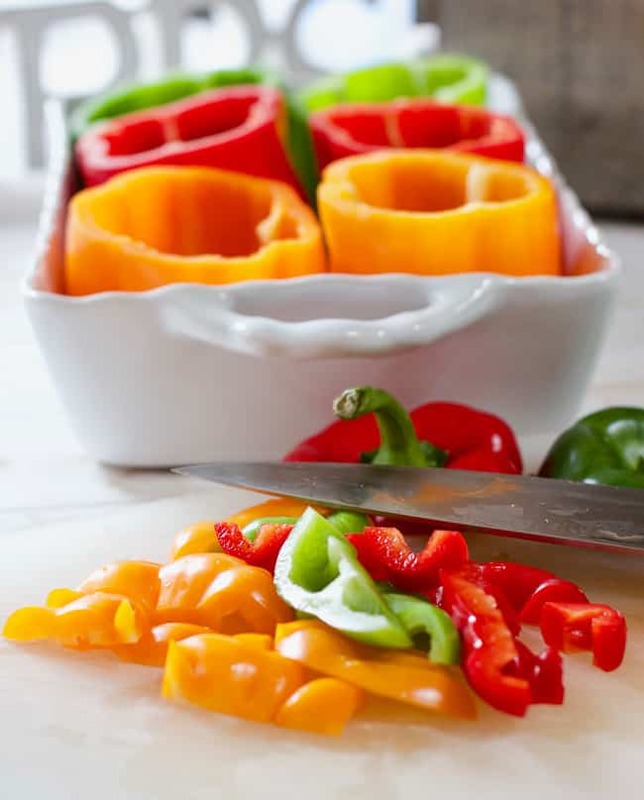 Cut the ends off of your rainbow of peppers. Save those tops because we are chopping them up and tossing them in the meat mixture. More veggies! Before you start browning your ground beef. Preheat your oven to 350. Now OVEN BAKE YOUR RICE while you are cooking up the beef filling on your stove top. Brilliant! Combine rice, hot water, cover and bake for 25 minutes. It will come out fluffy every time! (see recipe card below for details). After cutting the tops off the peppers and cleaning out the seeds and veins. Add a bit of water to the casserole dish, cover with plastic wrap and microwave on high for 2-3 minutes. This will soften up the peppers and they will be perfectly done when the dish reheats in the oven. So you have done all your chopping, mixing and TASTING FOR SEASONING! Don’t forget that. Especially when working with seasonings like chili powder and cumin. They vary greatly in their intensity. Now its time to stuff ’em! Your all stuffed up and ready for the oven! Bake about 20 minutes, top with cheese and you have a hearty but healthy meal! We eat these for days. I chop up the leftovers and toss them in salads and stuff them in tortillas. They make a great lunchbox treat as well! One Pan Southwest Chicken and Rice – Even the uncooked rice goes in the same pan! Lazy Day Chicken Enchilada Casserole – made with store bought rotisserie chicken and a handful of ingredients you probably have in your pantry ! To Easy Dinners with Tons of Flavor! Stuffed with ground beef, chicken or turkey. 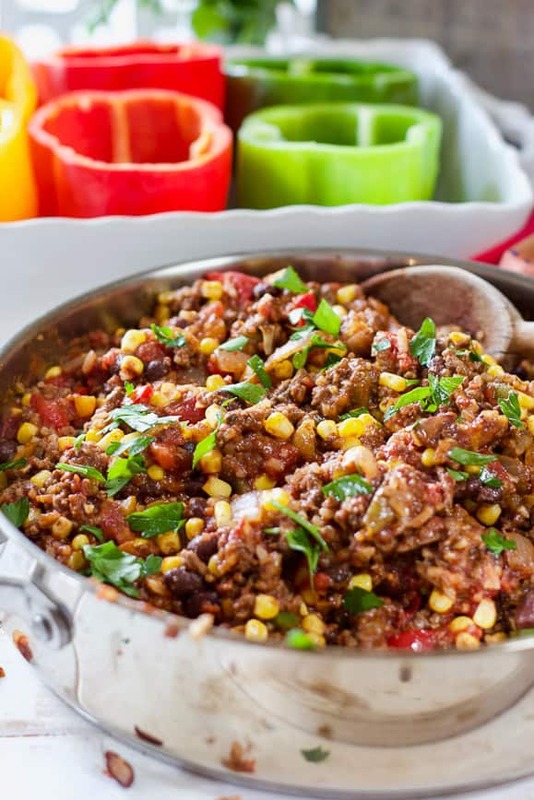 Add corn, black beans and rice to make a super flavorful filling! I include a super easy oven baked rice recipe as well but you can also cook it stove top following package directions or even easier, buy it pre cooked! These are just so bright and colourful. Perfect for a mid week meal with friends. Stuffed peppers are so versatile and greta way to include veggies into our menu. Love your recipe and the combination of flavors. All complement perfectly the peppers. 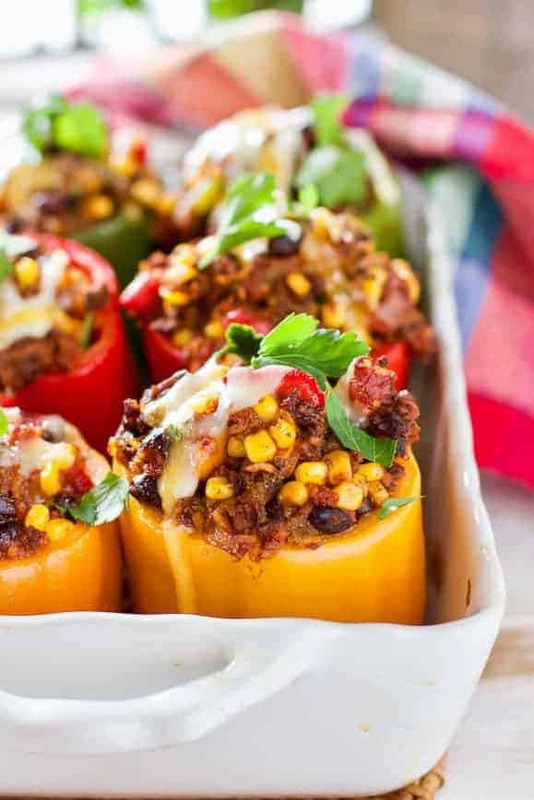 These stuffed peppers look so colourful, filling, and delicious! Love the idea of chopping it up and adding it to a salad or putting it in a wrap too! Thanks for sharing. 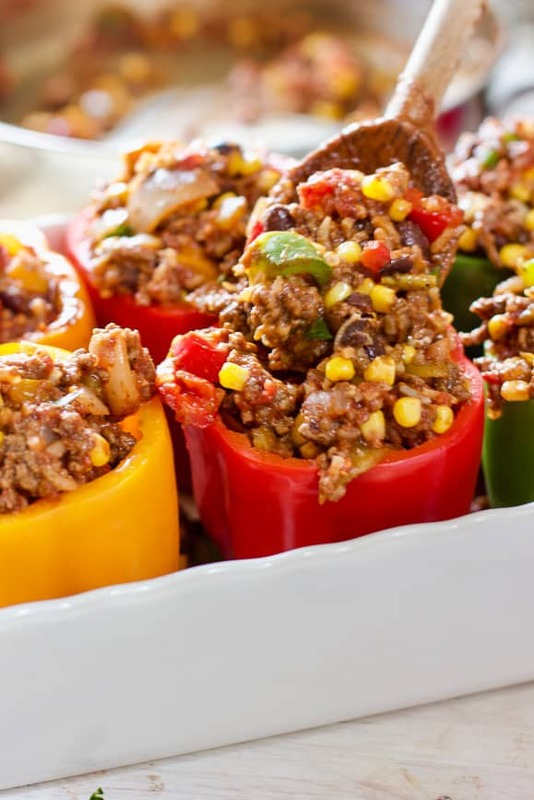 Stuffed peppers are one of our family favorites. I’m always looking for new recipes. This southwest style sounds delicious. Earlier today I was beginning to brainstorm meals for next week and I-kid-you-not stuffed peppers was top of my list! This looks like the perfect recipe to try! I love stuffed peppers! 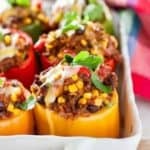 these look stuning, love that you added black beans and cumin! delicious combination of flavors!! Thank you for the nice note Albert! I hope you get a chance to try the recipe!